The Dollar/Yen surged to fresh new yearly highs in yesterday’s session, despite global equity markets closing negatively. Earlier this morning, the BoJ’s Consumer Price Index (CPI) increased 1.1% in February against the 1.0% forecasted YoY. The release helped limit the pair’s gains in the short-term. However, comments from the Fed Chair Powell mentioning that the US economy is in good shape and continued emphasis on patience for the monetary policy helped to push the pair to the upside. Yet, traders still face uncertain times when it comes to the US-China trade deal. The Dollar/Yen broke to new yearly highs until price found resistance at 111.75 (R1). A pullback towards 111.40 (S1) or 111.10 (S2) is expected before any additional gains on this pair. 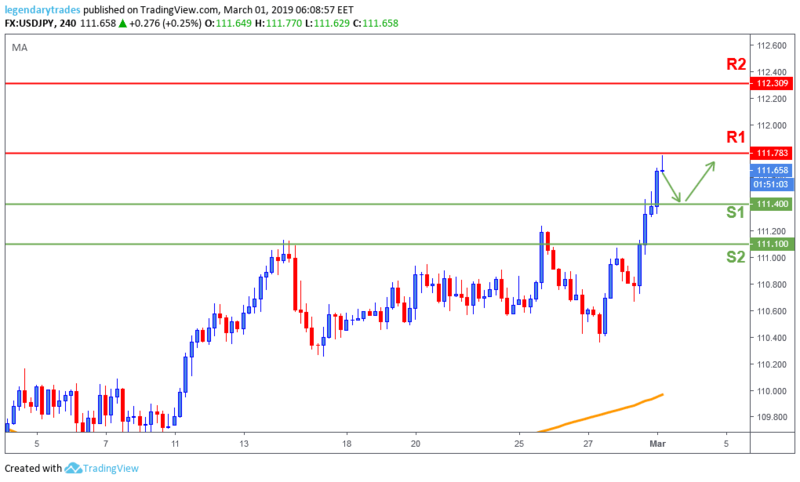 A break above the recent new highs could take price even higher towards 112.30 (R2).